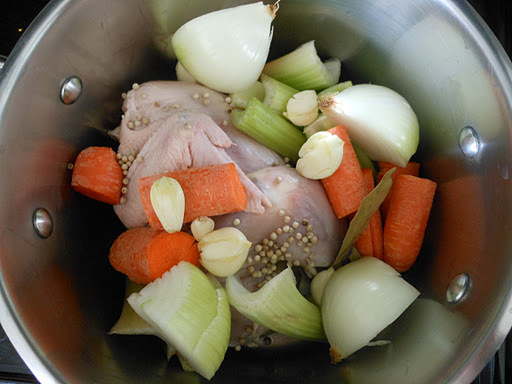 Last year I made a recipe for Turkey Noodle Soup (recipe is on the blog) with all the turkey we had leftover from Thanksgiving and it was good but this recipe for Chicken Soup is great! I needed to whip up something to cure this nasty cold that Billy was so nice to share with me and since I had a little chicken from McDowell Family Farm in the freezer I thought why not whip up some chicken soup- it can’t hurt! We don’t eat a lot of meat, mostly just what I can get local but thanks to the McDowell family and their wonderful chicken I might just out smart what’s ailing me! Enjoy! Simmer at medium heat for 1 hour. Turn off the heat, remove the chicken and place him or her on a plate to cool (when cool, pick off as much meat as you can, reserve for the soup). Strain the cooking liquid and the vegetables through a strainer- reserve the cooking liquid and the garlic. Set those two things aside and discard the rest. 1. In a large soup pot heat olive oil over medium heat, when you can smell the oil add the carrots, celery and onions. Saute until the veggies start to soften (about 10 minutes), season with salt and pepper. Next add the reserved garlic and stir to combine. 2. Next add the reserved cooking liquid, and the herb bundle. Turn the heat up just a bit. When the soup begins to boil turn heat back down to medium low and simmer for 30 minutes. 3. When the 30 minutes is up add the chicken meat and the fresh garlic, stir to combine. Check flavor to see if you need more salt and pepper. 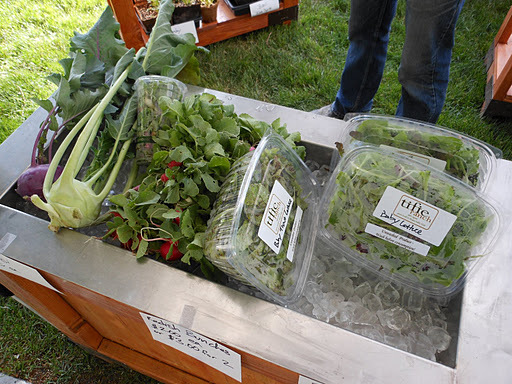 Take out the herb bundle and discard. 4. Serve hot just like it is or w/a sprinkling of Parmesan cheese and if using, your pasta of choice. Serve it Cordray style:1/2 c. Stellette pasta, ladle over warm chicken soup, squeeze a slice of lemon over soup and pasta, top w/huge handful of arugula and sprinkle on some Pecorino Romano. VIOLA! 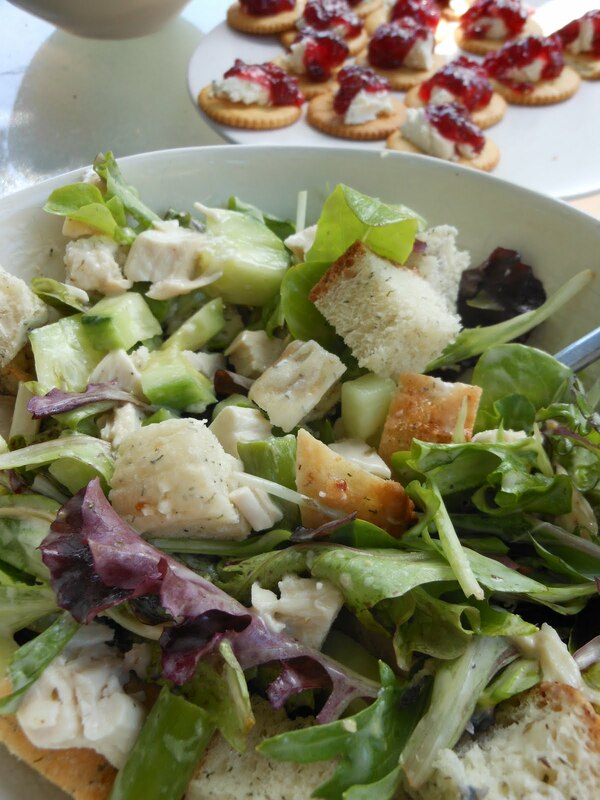 Just thought I would share a photo of the our Perfect Roast Chicken Salad’s, we actually got to sit out on our deck at the end of the week and share our lunch together. Perfect! 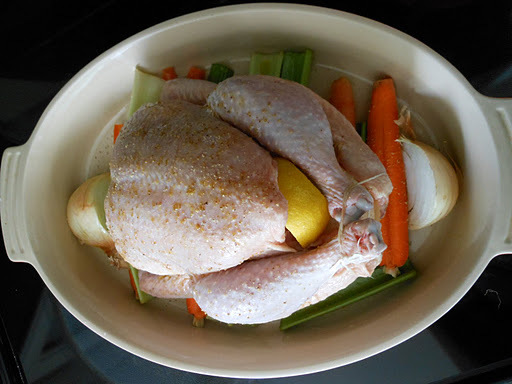 Roast Chicken is one of the easiest things to make and I believe that knowing how to roast a chicken is essential. I’m lucky enough to be involved in my community to access fresh chicken from local family farms, like McDowell Family Farms. I am very particular about the meat I bring into my house, and in my book, McDowell is hitting it out of the park. I hope you’ll try this recipe the next time you want to treat the ones you love, I SWEAR IT’S EASY! (that’s for my girl Kim) Enjoy! Isn’t this a pretty little chicken. The aroma in our house when this chicken came out of the oven was incredible. I roasted this chicken to make salads with for our lunches, but we had to make a quick sandwich and enjoy some of this delectable little bird. 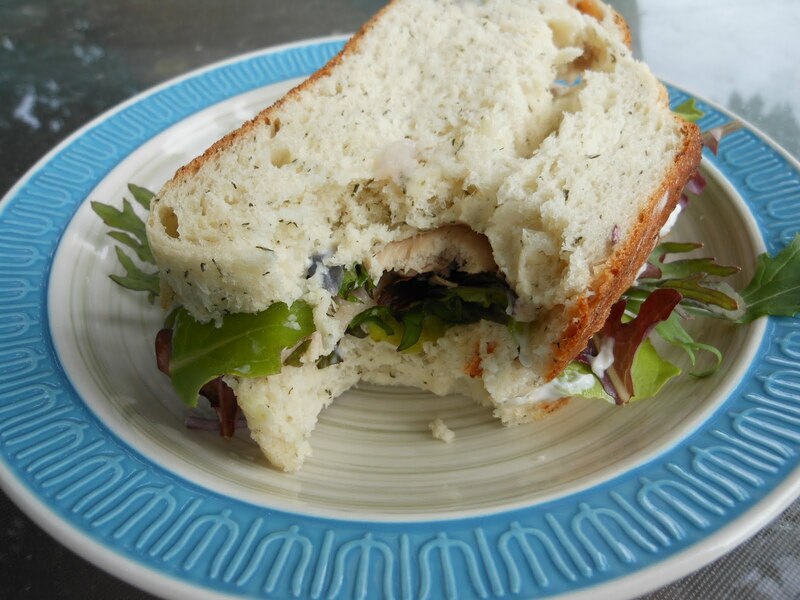 Volker’s Cottage Cheese Dill Bread, mayo and mustard, fresh greens from the market and Perfect Roast Chicken. 1. Preheat oven to 375 degrees. (Make sure that your chicken has had some time outside the fridge and is about room temp before putting in the oven). 2. I rinsed and dried (with paper towel) the chicken. In a roasting pan place the carrots and celery on the bottom of the pan, also 2 pieces of the onion. 4. Drizzle the outside of the little chicken with olive oil and season with salt and pepper. 5. 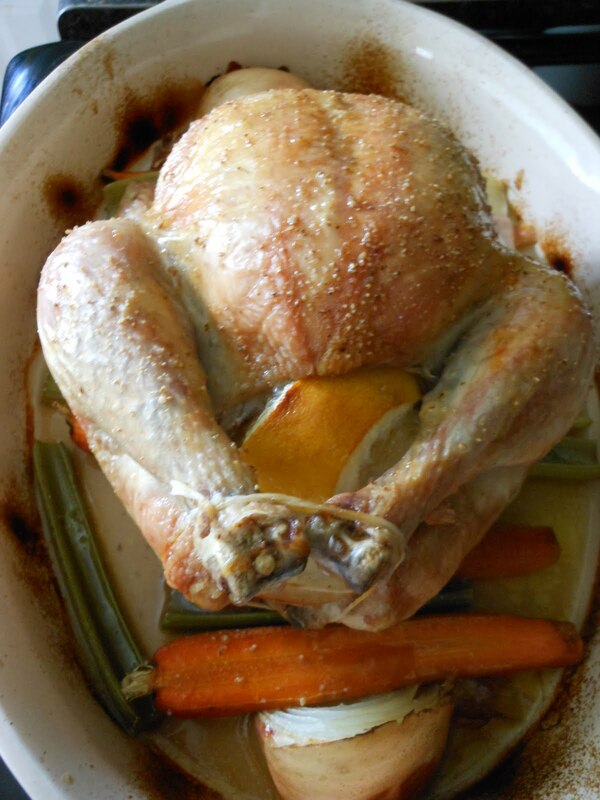 Place the chicken in the oven and roast for 1 hour 25 minutes. I used a meat thermometer to make sure the meat reached 165 degrees. Let the chicken rest for about 20 minutes before starting to carve.